A Media Access Control address (MAC address) is a unique identifier assigned to network interfaces for communications on the physical network segment. MAC addresses are used for numerous network technologies and most IEEE 802 network technologies, including Ethernet. Logically, MAC addresses are used in the Media Access Control protocol sub-layer of the OSI reference model. MAC addresses are most often assigned by the manufacturer of a network interface card (NIC) and are stored in its hardware, the card's read-only memory, or some other firmware mechanism. If assigned by the manufacturer, a MAC address usually encodes the manufacturer's registered identification number and may be referred to as the burned-in address. It may also be known as an Ethernet hardware address (EHA), hardware address or physical address. A network node may have multiple NICs and will then have one unique MAC address per NIC. MAC addresses are formed according to the rules of one of three numbering name spaces managed by the Institute of Electrical and Electronics Engineers (IEEE): MAC-48, EUI-48, and EUI-64. The IEEE claims trademarks on the names EUI-48 and EUI-64, in which EUI is an acronym for Extended Unique Identifier. 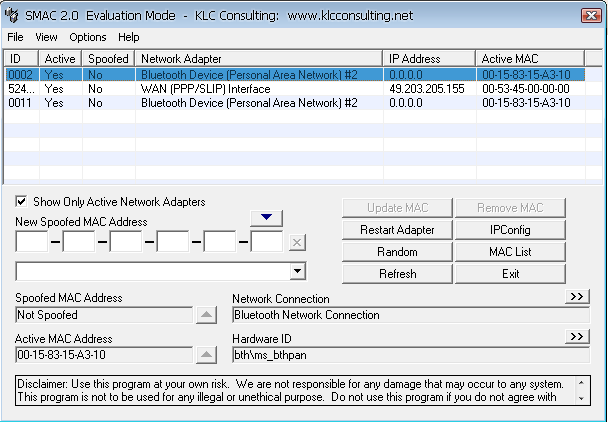 Why I change my Mac Address? There are many software on Internet in which each computer has to enter a unique key or serial to activate. So, by purchasing that type of software, we can install it only in one pc (that's what they think). But by spoofing the mac address, we can install it on unlimited no. of devices with same key. This can be useful for privacy reasons, for instance when connecting to a Wi-Fi hotspot, Some internet service providers bind their service to a specific MAC address; if the user then changes their network card or intends to install a router, the service won't work anymore. Changing the MAC address of the new interface will solve the problem. A MAC address is 48 bits in length. The Operating system is the interpreter between the hardware devices. When a software wants MAC address of any device, it asks the Operating system to return the mac Address. OS finds the MAC Address of the device and returns it to the software.So, here we are going to spoof it. Install the following software in it. Thus when any software requests OS to return mac address, the software redirects it to return the spoofed address. Thus the software "thinks" that it is the original one.